Western political philosophy has its roots in the polis, or the city-state of ancient Greece. City-states like Athens and Sparta were relatively small and cohesive units, and within the compact geographic area of mainland Greece--often physically separated by mountains--adopted contrasting forms of government. Greek political philosophers accordingly were considering how government could be justified and structured in the special community of the polis, whose residents often were able to interact personally in deciding their affairs. Greek philosophers discussed government in the context of wider questions on the nature of life, happiness and justice. They asked what ought to be a person's relationship to society and which forms of government and social existence are most likely to produce the ideal state. Much of the debate centered on the merits of governance by single rulers or aristocratic elites compared to broader public participation in more democratic structures. Over time, the individual polis might shift its emphasis, such as centralizing control during wartime, when quick, decisive actions were essential, or allowing wider public decision-making in more peaceful periods, when there was more time for deliberation and debate. 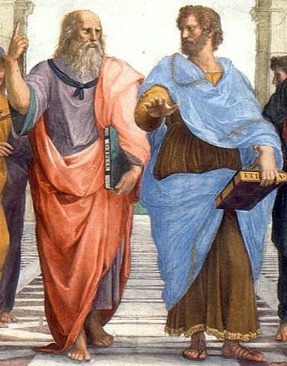 The Athenian philosophers Plato (424-348 BC) and Aristotle (384-322 BC) also discussed how the organization of the city-state was associated with questions of justice and the well-being of individual citizens. In Plato's ideal state, as outlined in the dialogue led by his mentor and central character Socrates in The Republic, the philosopher is the most suited to rule since he by nature pursues truth and learning and is free from the greed and other temptations of others who seek power. The "philosopher-king" would govern a utopian society in which "no man calls anything his own." ....The society we have described can never grow into a reality or see the light of day, and there will be no end to the troubles of states, or indeed...of humanity itself, till philosophers become rulers in this world, or till those we now call kings and rulers really and truly become philosophers, and political power and philosophy thus come into the same hands. Aristotle's Politics conceived of government and politics as an organic collection of interdependent parts. To Aristotle, the relatively compact and cohesive polis functioned ideally as a political "community" or "partnership" which allowed at least some citizens the possibility to live a good life, a goal beyond simply coming together to protect personal security and foster economic exchanges. In the Middle Ages, sovereigns based their authority on divine right, claiming that their rule and decisions were sanctioned by God. In 1215, however, King John of England agreed to the demands of his barons and bound himself and his "heirs, for ever" to protect the rights and liberties of "all freemen of our kingdom." With Magna Carta, King John placed himself and England's future sovereigns under the rule of law. ....No Freeman shall be taken, or imprisoned, or be disseised of his Freehold, or Liberties, or free Customs, or be outlawed, or exiled, or any otherwise destroyed; nor will we pass upon him, nor condemn him, but by lawful Judgment of his Peers, or by the Law of the Land. In contrast to the more abstract issues explored by the Greek philosophers, Nicolo Machiavelli (1469-1527) dealt with the practical problems a monarch faces in staying in power. In his classic treatise The Prince, he argues, for example, that the ruler should know how to be deceitful when it suits his purpose, but should attempt to avoid disclosure of his deceptions to his subjects. ....Here a question arises: whether it is better to be loved than feared, or the reverse. The answer is, of course, that it would be best to be both loved and feared. But since the two rarely come together, anyone compelled to choose will find greater security in being feared than in being loved. The British author John Locke (1632-1704) had perhaps the most direct influence on the justification for the American revolution and the evolution of its government. In his Two Treatises of Government, Locke sought to refute claims that monarchies were sanctioned by divine right, arguing that men were by nature free and equal with inherent rights to life, liberty and property. Legitimate government, according to Locke, could exist only when these rights were voluntarily given up through a social contract by which people conditionally transferred their rights in return for such benefits as the government's protection of their liberty, security or property. Since governments exist by the consent of the people to advance the common good, rulers who breached the social contract can be resisted and replaced through revolution, a central theme of Locke later reflected in the Declaration of Independence and in The Federalist Papers supporting the adoption of the U.S. Constitution. ....Men being, as has been said, by nature, all free, equal, and independent, no one can be put out of this estate, and subjected to the political power of another, without his own consent.